It started out as a simple neighborhood restaurant, on an Elizabeth Avenue street corner, across the street from Weequahic Park, in what originally had been a private residence. In thirty years under its founder, it evolved into Newark's greatest restaurant ever, with a national and international reputation, serving as many as 2,300 patrons daily. I'm writing about The Tavern Restaurant at 444 Elizabeth Avenue, on the corner of Meeker Avenue, in Newark's Weequahic section. In its lifetime, it won a reputation for the excellence of its food, for the quality of its food service, and as a place where the average Newarker could meet and eat with the elite. Almost everyone who was anyone ate at The Tavern1. It was a place where Newark politicos ate...where leaders of Newark business and industry met for power luncheons...where organizations had their late night planning sessions...where you went for a special occasion, an important meeting, or a date that you wanted to impress. Though its interior design was not too pretentious, it was attractive in its simplicity, and at its peak in the 1950s, The Tavern was doing business in excess of $1.5 million a year. Not only was the food fare considered of the highest quality, but its baked goods enjoyed such a demand that a separate Tavern Pastry Shop was built adjacent to the restaurant that sold only the Tavern's pastries, and had its own following2. In the recollections that follow, I will try to re-create the life and times of The Tavern, and of its founder/owner/manager -- Sam Teiger, who built the business to its greatness by being a good businessman who mixed hard work and dedication to high professional standards with common sense and diplomacy, to create Newark's most unique and famous eating establishment. Sam Teiger was the most genial of hosts. Here is a recollection of Teiger by former Newark journalist, educator and fraternal organization leader, Ben Unterman. "No matter how hard you tried to beat the crowd, you lost. It was always crowded, and you had to stand in line in the vestibule. "There you would get a warm greeting with 'forshpeisers' while you were waiting. You didn't mind waiting, because there was Sam greeting one and all, 'Hi, Ben; Hi Dave; Hi, Jack! '...always the elite, or those who thought they were elite for you to talk to while you were waiting. "I recall, one time Teiger called my name. Oh, oh! I had forgotten to wear my jacket! No worry...Sam looked at me and figured my size and came back with a tan jacket...sometimes too small, sometimes too big. "No matter how long we had to wait in the vestibule, we didn't mind because we considered ourselves a member of the elite. Those who didn't want to wait were the 'commoners' who left to go to the Weequahic Diner, a short way down Elizabeth Avenue." Aside from the fact that The Tavern originally opened in what became the heart of Newark's upwardly-mobile Jewish community, it was not a Jewish restaurant in the dietary sense, although its menu included many Jewish-style dishes. Over the years, in virtually all of Newark's Jewish organizations, important meetings would usually end with the participants moving on to The Tavern to continue their discussions. In the restaurant's early years, founder/manager Sam Teiger went through many struggles before his restaurant caught on with its patrons. The turning point, according to Teiger's recollection in an old newspaper interview, came in the mid-1930s when his food establishment gratuitously catered a buffet dinner for more than 1,000 guests at a benefit for the Beth Israel Hospital. Teiger said The Tavern's future success started on that day. It's beginning menu, when the restaurant opened in 1929, consisted of a printed 4-inch by 6-inch card, with a selection of a five-course luncheon for sixty five cents, or a dinner for a dollar (The Tavern Menu3). As The Tavern flourished in the 1940s and 1950s, Teiger employed the Willmark Service System of 671 Broad Street, Newark, licensed private investigators, to have its operatives visit the Tavern as patrons periodically, and to observe and report to him on the quality of the service and "irregularities in the handling of cash payments." Bill Newman, the Assistant Manager at Willmark, made "test" visits personally as he considered this a plush assignment. He would report the test results directly to Teiger. "Mr. Teiger was proud of the reputation of The Tavern," he told me recently, "and he always looked pleased with a positive report. On those rare occasions when I made a report that affected an employee's honesty, he would get a hurt look on his face, and tell me "I'll take care of it. It must all be a mistake." "From my dealings with him," Newman added, "I found him to be conscientious and hard-working -- a real gentleman of the old school." Pressed for information about Teiger's management practices, the former Willmark operative recalled to me "Sam was a tough disciplinarian where any phase of the Tavern operation was concerned. He ran the place like a military installation. He was known to fire an employee that set a table with a piece of dirty silverware." Over the years, Teiger developed and refined a service handbook which outlined recommended procedures for his waiters and other food service personnel in virtually every aspect of Tavern operations related to dealing with and serving customers. The Tavern Service Guide was periodically updated and revised. I recall observing revision work on the Tavern service manual being done in 1950 at the Max Walter Advertising Agency at 449 Baldwin Road in Maplewood. Sy Walter was supervising the revision work. My last visit to The Tavern was on January 10, 1957. It was a memorable one. I had just scripted and staged a surprise "This Is Your Life" program for former Newark boxer Lou Halper (and now a respected Newark businessman) at the Hillside B'nai B'rith Lodge. One of Halper's surprise guests was former world lightweight and world welterweight boxing titleholder, Barney Ross, who'd come in from Chicago for the occasion. During Lou Halper's boxing career he had faced off against Champion Ross in a non-title fight, and the two had remained good friends. Anyway, after the B'nai B'rith program had ended, Lou Halper took Barney Ross down to The Tavern Restaurant for a late night snack. He had invited me to accompany them, which I did. In his autobiography, former New York City three-term Mayor Ed Koch, recalling his boyhood days growing up in Newark, wrote about his good friend Donald Fischer "who lived in our building at 61-71 Milford Avenue." Wrote Koch: "Donald's father was part owner of one of the most popular Newark restaurants, The Tavern, and I remember going to his apartment and eating wonderful things that we never had in out house." At the height of World War II, as the Thanksgiving holiday approached in 1944, Tavern Owner Teiger advertised that The Tavern would be closed to the public on that holiday, and that all enlisted servicemen and servicewomen were invited to enjoy Thanksgiving at The Tavern as his guest. According to newspaper reports, more than 3,000 uniformed men and women took advantage of Teiger's offer. In September 1959, founder/owner/manager Teiger celebrated The Tavern's 30th Anniversary of its founding. At the time of the celebration, the Newark Evening News, on September 15 1958, called The Tavern "one of the oldest and most popular eating places in Newark...with a prominent position on an authentic listing of the 50 most popular restaurants in America -- one of the top 25 to be exact." The Newark Evening News article cited The Tavern as having an international reputation as well, by reporting that "United Nations delegates selected The Tavern as one of the most popular eating places in the United States, according to a survey...published in Epicure Magazine." The Newark News article went on to describe The Tavern's operation at the end of 30 years: It had continued its unique rule of never making table reservations while operating seven days a week...it served as many as 2,300 customers a day...it had doubled its seating capacity from the original 120 to 250...it had expanded its list of original 42 employees to 150 full-time employees." 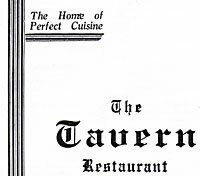 The month following the Tavern's 30th Anniversary Celebration, Sam Teiger announced the sale of The Tavern on October 19, 19594. Although The Tavern Restaurant was a seven-day-a-week operation, Sam Teiger managed to affiliate himself with, and subsequently become active in numerous business, religious, charitable, and educational organizations, both at The Tavern, and during his subsequent retirement years. He had been a member of the board at the Beth Israel Medical Center...board member of the Jewish Community Council...Food Division Chairman of the Essex County United Jewish Appeal...President of the New Jersey Restaurant Association...Board member of the Golub corporation--a chain of 30 New York supermarkets...Board member at Fairleigh Dickinson University. He also held memberships in the Temple B'nai Jeshurun, the American Jewish Committee, and the American Jewish Congress...was active n the Newark campaigns of the Community Chest, the Red Cross, and the Heart Fund. The end for Sam Teiger came on August 9, 1972, when he died at the age of 69 -- 12 years and eight months after his retirement from The Tavern. Services were held on August 11, 1972 at Temple B'nai Jeshurun. At the time of Teiger's death, he had been a lecturer on hotel and restaurant administration at Fairleigh Dickinson University. Henry Fischer, Teiger's brother-in-law, who had joined him in partnership shortly after The Tavern's opening and remained a partner until its sale, pre-deceased Teiger. He died January 7, 1963, after a long illness. During the 30-year life of the Tavern under the partnership, Fischer had been in charge of the Tavern's production and quality control. The building housing The Tavern had originally been built as a two-story family residence. In the 1920s up until the start of The Tavern Restaurant by Sam Teiger, the building, converted for business use, was occupied by two Newark firms for many years: Service Systems, Inc. (Advertising), and the Peerless Laundry, Inc.
After The Tavern cease operations, the building was demolished. The site is now occupied by a high-rise apartment building. "Waiting wasn't limited to the vestibule. I remember being on line going up Elizabeth Avenue past Krich-Radisco." "The only one I remembered who didn't have to wait for a table at The Tavern was Longy."